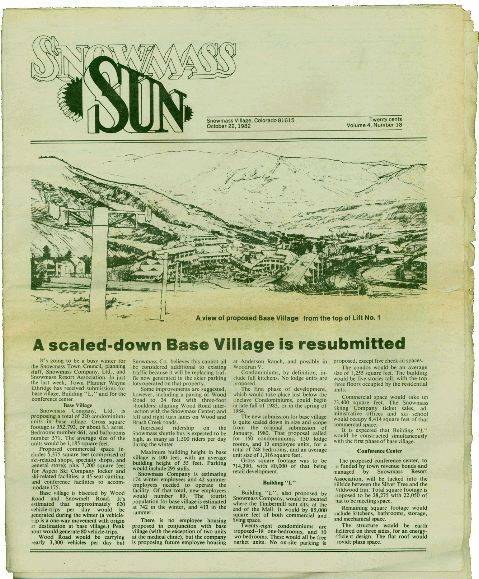 A 1982 issue of the Snowmass Sun contains a story about a Base Village proposal. It’s been more than a month since Snowmass voters approved Base Village, the nearly 1-million-square-foot development proposed by Intrawest and the Aspen Skiing Co. for the base of Fanny Hill.It took a review process that lasted nearly four years and an intense, at times ugly referendum campaign. It was also the fourth major base village proposal to come before the town in its short history (Snowmass Village was incorporated in 1977). In the fall of 1982, the Snowmass Town Council was gearing up to review yet another base proposal, and like the most recent one, it dominated the pages of the Snowmass Sun.They say history repeats itself, and it’s interesting to look at what was being considered in the past, compared to what Snowmass has accepted today.The 1982 proposal called for 220 condominium units; Intrawest’s Base Village will have more than 600. The old proposal encompassed nearly 353,000 square feet, about a third of the current base project, but only 5,375 square feet of retail space (as opposed to 65,000 square feet in the current proposal). Oddly enough, “locker and ski-related facilities” got 7,200 square feet. Maximum building height in the 1982 proposal was 100 feet, equivalent to 10 stories. Height and mass were major concerns over the current project, in which the tallest building has six stories.